China has completed its cycle as a high-growth, low-wage country and has entered a new phase that is the new normal. China will continue to be a major economic force but will not be the dynamic engine of global growth it once was. International capitalism requires a low-wage, high-growth region for high rewards on risk capital. In the 1880s it was the United States, for example. China was the most recent region, replacing Japan. No one country can replace China, but we have noted 16 countries with a total population of about 1.15 billion people where entry-level manufacturing has gone after leaving China. 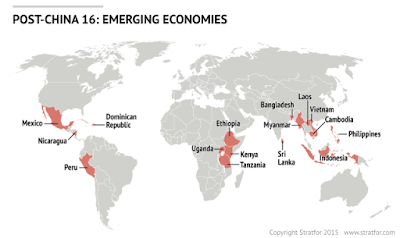 Identifying the Post-China 16 countries is not a forecast. It is a list of countries in which we see significant movement of stage industries, particularly garment and footwear manufacturing and mobile phone assembly. The Post-China 16 countries are strictly successors to China as low wage, underdeveloped countries with opportunities to grow their manufacturing sectors dramatically. The new activity is focused on Africa, Asia and to a lesser extent, Latin America. When you look at the map, much of this new activity is focused in the Indian Ocean Basin. The most interesting pattern is in the eastern edge of Sub-Saharan Africa: Tanzania, Kenya, Uganda and Ethiopia. It is primarily garment and footwear manufacturers that are firstly starting to relocate. The second area where there has been a change-over is the market of cell-phone assembly operations. In the first field it’s the skills that are easily exploitable in the workforce. In the second sector of activity is the need to have low-prices to be competitive. 50 Turkish garment factories are currently relocating to Ethiopia for example. Hennes & Mauritz AB (H&M) are also currently considering purchasing more than 1 million garments from Ethiopia every month. Costs per unit in Ethiopia are 50% cheaper than in China at the moment. However, this is estimated to rise to the current Chinese level by 2019. Chinese salaries increased last year by 17.1% and the previous year it was 18%. Salaries in China are on average just 30% lower than in the US today. Salaries in China now exceed those in Mexico and in Turkey. Ethiopia has an economic growth of 10% today. However, it remains one of the poorest countries in the world despite having one of the top economic-growth prospects of the continent. Sri Lanka, Indonesia, Myanmar and Bangladesh are directly on the Indian Ocean. The Indochinese countries and the Philippines are not on the Indian Ocean, and even though I don’t want to overstate the centrality of the Indian Ocean, they are nearby. At the very least we can say that there are two ocean basins, the Indian Ocean and the South China Sea. Peru, the Dominican Republic, Nicaragua and Mexico are the Post-China countries in Latin America.